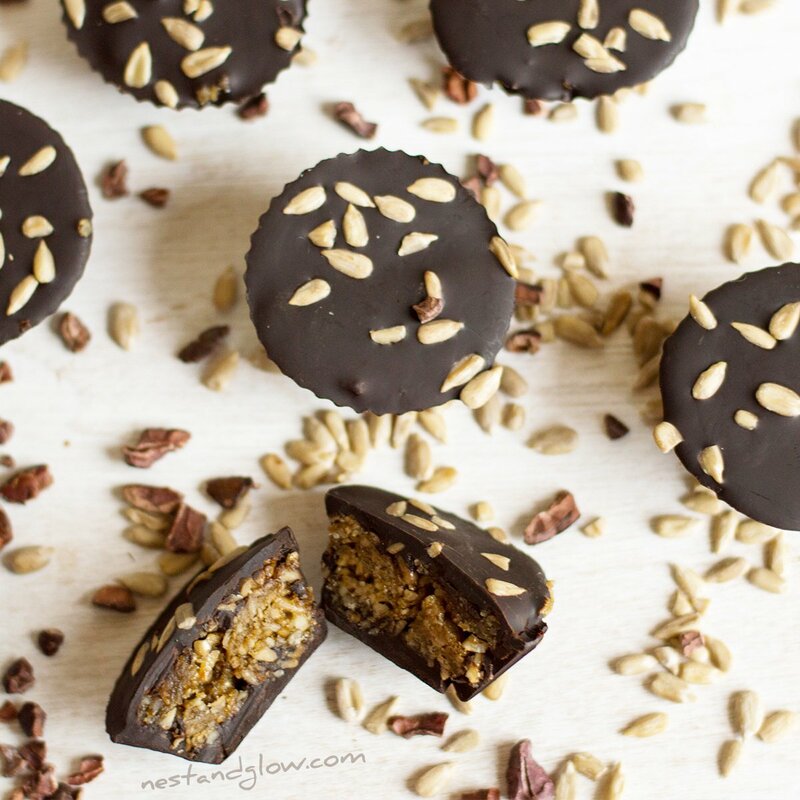 Homemade sunflower seed caramel is surrounded by dark bitter chocolate in these easy to make sunflower seed cups. 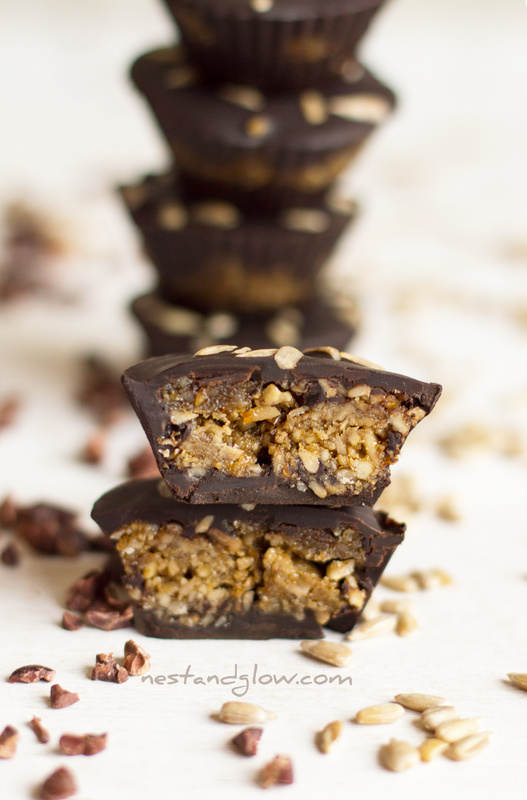 Sunflower seed caramel cups taste similar to traditional peanut butter cups but are free of the dairy, nuts and palm oil. Suitable for nut-free, vegan, gluten-free, soy-free, coconut-free and Paleo diets. As these cups are made from sunflower seeds they are relatively inexpensive. Good quality sunflower seed butter isn’t available everywhere and is usually quite expensive so in this recipe uses whole sunflower seeds. I consider these dark chocolate seed cups a healthy treat as they are loaded with nutrition, protein, fibre and minerals. They do contain some sugar but this is slowly absorbed into the body thanks to all the natural healthy fats. Use date syrup for a cheap and natural sweetener. 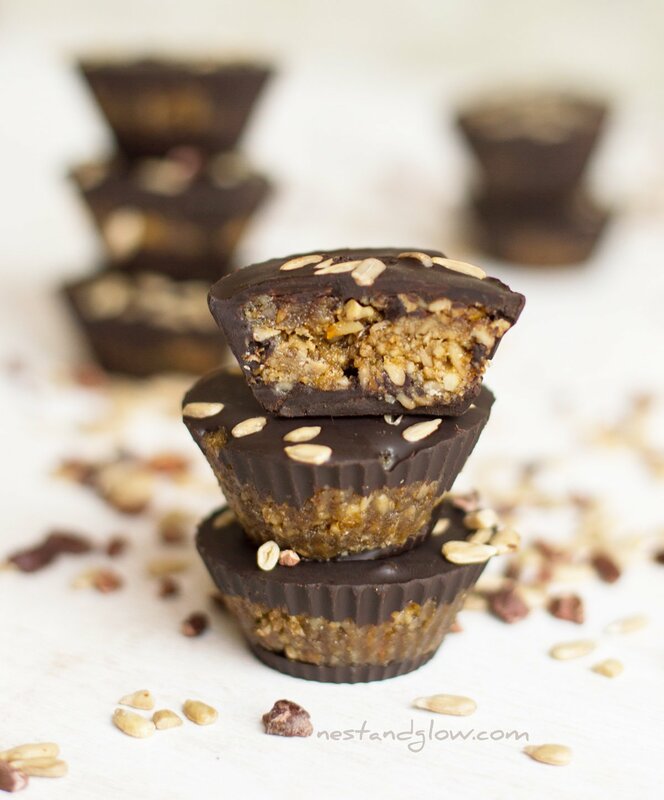 It’s easy to eat way too many nuts and get an uncomfortable stomach so I love nut free vegan healthy treats like these sunflower seed caramel cups for a change. 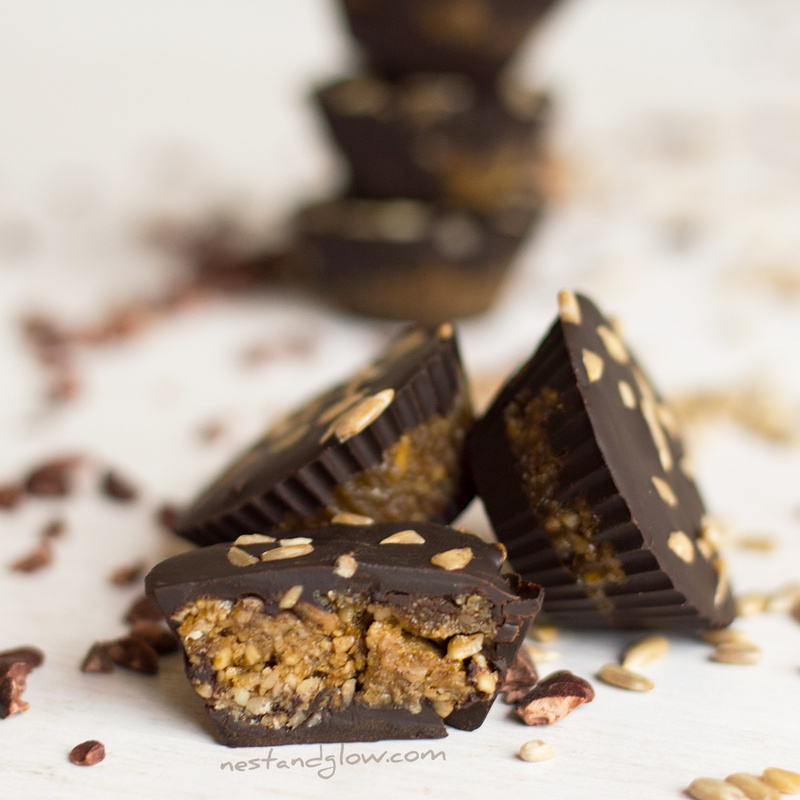 The seeds are roasted to give the sunflower cups a similar taste to a peanut butter cup. Roasting also makes the sunflower seeds blend smoother as the oils are easily released. It is difficult to get a smooth homemade sunflower seed butter without adding additional oil but the chunky crunchy texture of the sunflower seeds works well with the smooth dark chocolate. You can make a raw version of these sunflower seed candies by instead of roasting the sunflower seeds soaking them in water for 8+ hours with a pinch of salt. Then drain and rinse the seeds and use in the recipe. For as raw chocolate coating; melt 1/3 raw coconut or cacao oil then mix with 1/3 cacao powder and 1/3 of a liquid sweetener (like maple syrup or coconut nectar). This raw chocolate topping can be used like melted chocolate. Silicone moulds about 1″ in diameter were used to make these chocolate seed cups as they are firm enough to allow you to press in the sunflower seed filling. You can use paper ones but they will need to be in a lined tin for rigidity. I do like using silicone moulds to make these sunflower seed chocolate treats as they last a long time so never run out. I used an 85% cocoa solids dark chocolate to make these sunflower chocolate sweets. The bitter dark chocolate complements the sweet sunflower seed caramel centre. If you don’t eat dairy remember to check that the chocolate you buy is dairy free as I’ve noticed butter oil in some dark chocolate. A high cocoa chocolate is used to make these low sugar and give a rich robust flavour. Sunflower seeds have lots of health benefits including reducing inflammation, preventing cardiovascular disease, reducing cholesterol and helps to calm your nerves. This is due to them containing magnesium, selenium and vitamin E.
Spread the sunflower seeds on a pan and roast for 10-12 mins at 190C / 375F. Take out of the oven as soon as a few seeds turn golden. Watch like a hawk as they can burn quickly. Place the warm seeds along with everything else apart from the chocolate into a blender and pulse blend to make a sunflower seed caramel paste. Depending on your blender you may need to scrape down the sides and blend for several minutes until it combines. Melt 3/4 of the chocolate in a double boiler then add melt the last 1/4 off the heat for easy tempering. Pour half of the chocolate into the cases and then chill for a few mins to set. Press the sunflower caramel into the cases then cover with the remaining chocolate. Sprinkle with sunflower seeds and chill to set. Enjoy within a week and store in the fridge. If you want a smooth seed butter then blend the seeds first on their own, but you will need a powerful blender and some patience. I find a food processor is best at making the seed paste, but a liquidiser or a jug blender (in batches) also works well but requires more scraping of the sides and blending. Sounds like they would be great, thanks for sharing! Of I added more maple syrup would it be ok wo leave out the molasses? Have you tried that? What can you substitute for the molasses please?